Are you planning on attending a Halloween dog parade or a party at your doggie daycare and can’t think of what to dress little Rorie up as? 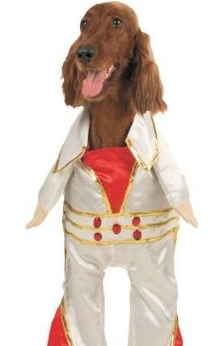 Sure, there’s the costumes that you can buy that look great if your dog sits so the front legs pose as the legs of the costume (ex: prisoner, cop, Elvis) but when they stand up and walk around, it’s all out of whack. Plus, you’re not sure if the other dogs might tug on the fake little arms or if your dog will rip it while she’s playing. There’s also the fear of the costume having small plastic bits that other dogs or your dog might bite off and swallow. This weekend, while looking to see what new trends were out there for pet costumes, I came across several costumes that could work well for a dog who may be socializing and trick or treating and needs to look great. I found a series of these online doing a google image search for pet costumes. 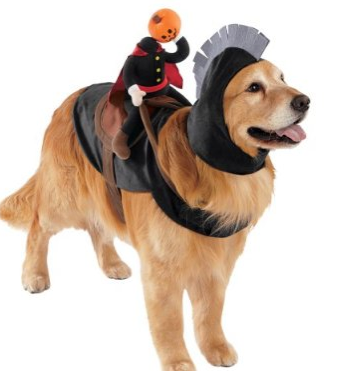 The costume is simple: take a harness and decorate it with a little stuffed person on top to create any of the following: a cowboy atop his trusty steed (your dog), a knight going into battle, a headless horseman, or a jockey racing to the finish line. Basically, your dog is a horse and a super useful one to any one of these little stuffed guys who need him. The costume itself is easy enough to put on your dog and shouldn’t feel much different from wearing a harness. If your dog is active and hyper, a full blown costume might make her feel confined. This simple, yet funny, costume is light, easy, and can be bought or created at home if you’re crafty. 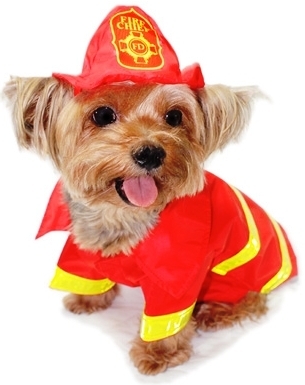 This fireman costume is available at many pet stores and online stores. It’s a simple costume with no dangling pieces and should fit and feel like a dog jacket. If your dog is used to wearing a vest or raincoat during cold and rainy weather, then this costume should be fairly comfortable for her. The only part that shouldn’t stay on for long is the hat. The elastic that holds it on could start to dig into the dog’s neck or another dog could grab it and pull it off. Playing and running shouldn’t be a major problem and is easy to put on and take off. To complete the look, you can see if your local pet store sells black dog booties. If your dog is a goofball and hyper, go for a simple costume. One that is easy to take off and easy for your dog to wear. You don’t want to put wings and hat on a dog that will just turn around and try to chew it off or run in circles because she’s not sure what’s on her and freak out. Pick a costume that is light, has little to no extra hanging bits like fake jewels or fake arms, and doesn’t have glitter. One more final costume style that will work for a fidgety dog is a simple one that fits like a vest on your dog and may feel like a blanket on her back. It clips closed under the chest and belly and some have a stuffed part on the top depending on the costume. 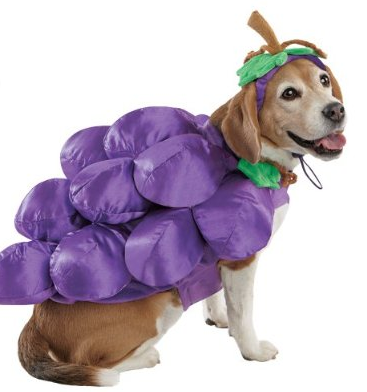 Your dog could be a dragon, a cat, a bee, a pumpkin, or a bunch of grapes. Whatever you choose to dress your dog up as for Halloween, make sure it’s a costume that your dog will be ok wearing. Get your dog used to wearing the costume by putting it on for a few minutes everyday and offering praise and positive reinforcement as your dog wears it and walks around in it. That will cut down on any anxiety or tantrums the day of the party. If your group is having a contest – hope you win first prize!